The Hyatt Hydra Hydrant for the Great Chicago Fire Hydrant Public Art Program to benefit the 100 Club of Chicago. Hydrant sponsor is the Chicago Regency Hyatt who deserve massive applause for supporting a great cause in this public art initiative. The Chicago Regency Hyatt have been an amazing partner, in that they are further fostering the arts by having me paint the piece in the style of the M(ani)fest Mural painted for Chicago Artists Month. 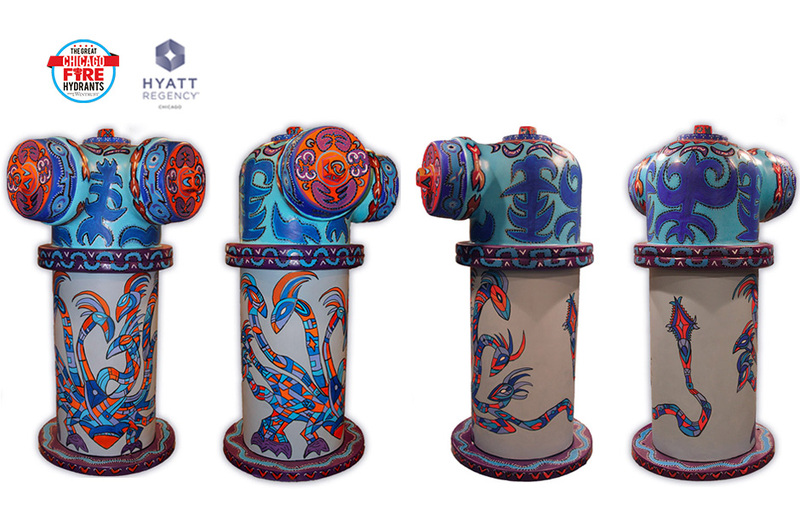 The Hyatt Hydra Hydrant along with concept paintings and drawings for the M(ani)fest Mural will be on display in the Chicago Regency Hyatt lobby.